Google-owned Nest is releasing a new version of its thermostat that has a larger display and is a little smarter than its predecessor. The high-resolution display is 2 inches in diameter, or 40 percent larger than the second generation model, making it easier to read from a distance. The thermostat also has a slightly thinner profile. There's a new feature called Furnace Heads-Up, which allows the device check in on furnace activity. Twice a year, the thermostat will look at furnace shut-off patterns to determine if there's an overheating problem. If suspicious activity is detected, users will be notified on the display, through the Nest app and in their monthly Nest report. Owners of first and second generation thermostats will get the feature later this year, through a free software update. Nest can already detect when a person is nearby and turn on its display. The new model gets a feature called Farsight, which can spot people when they're farther away, like across the room, and allow the display to come on then too. It's presumably easier to see from a distance because it's bigger. A new feature on Nest's thermostat, called Farsight, can display information like the target temperature when users are farther away. Those are the main changes. The deeper forms of intelligence Nest is known for, which allow it to program itself based on its owners' activities, remain largely unchanged. Like the existing models, the new thermostat works with the other Nest products -- the Protect smoke and carbon monoxide detector and the Nest Cam. For instance, users can already set the Nest Cam to automatically record video when the thermostat is set to away mode. Nest often adds new smarts to its devices through software updates. Most recently, new safety features were rolled out to better alert thermostat users of dangerously low or high temperatures, and to add new links between the thermostat and Protect. The third generation thermostat is available starting Tuesday for US$249 from the Nest website and from Amazon, and will soon be at retailers including Best Buy, Lowe's, The Home Depot, Target and Verizon Wireless. 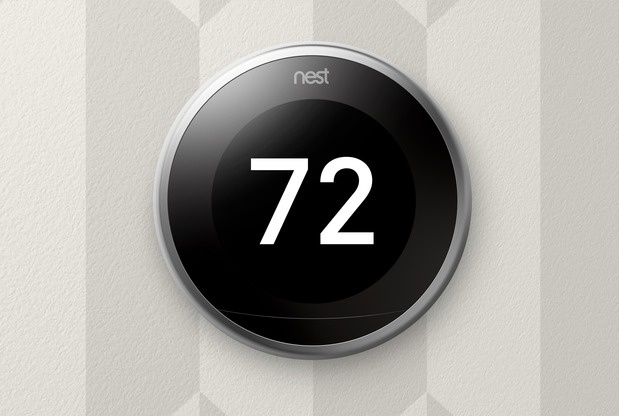 Nest says its thermostat works with most furnaces. At a later date, it may introduce a feature similar to Furnace Heads-Up for people in Europe who have a boiler rather than a furnace. The price of the second generation model will drop from $249 to $199 while supplies last.